Earlier I introduced the 8-inch Parrott rifle and discussed the design and production particulars. Time to look at the functional and operational aspects of the weapon. The 8-inch Parrotts used projectiles designed by Robert Parrott, of course, along with those of Charles T. James and John Schenkl. However, those of Parrott were obviously better adapted for the guns. Modern historians have identified three general variations among the Parrott projectile designs, differing with regard to the construction of the brass sabot. For the big 8-inch projectiles, only Types II and III are known, with high and low attachment points for the brass band over the base of the round. While the Army apparently ordered both types, the Navy preferred Type II. Although when stocks were low, the Navy used Type III projectiles either from Army sources or direct from the vendor. Like the smaller 6.4-inch Parrott, the 8-inch model’s solid bolt projectiles were designed with warships or fortifications as primary targets. For anti-ship use, the Navy preferred a lighter bolt than the Army. Navy ordinance officers focused on Confederate ironclad targets. Typically such engagements were close range affairs. Navy instructions called for the use of light weight bolt with “chilled” noses. Such projectiles accelerated rapidly maximizing penetration under 1000 yards, at the sacrifice of accuracy and effectiveness at longer ranges. Thus shot for the Navy’s 8-inch Parrotts weighed between 125 and 150 pounds and between 12 and 14 inches long. The Army, however, preferred to engage enemy ironclads at greater ranges. Heavier bolts offered better accuracy, and penetrating force, at those ranges. Army bolts weighed 200 pounds and was about 17 inches long. The 8-inch Parrotts also used “long” and “short” Parrott shells, but the service distinction appears less explicit. The Navy used anything available at several points in the war, particularly during the 1864 bombardment of Fort Fisher, North Carolina. But perhaps the most famous of the 8-inch shells were those hurled by the “Swamp Angel” into Charleston, South Carolina in 1863. A few 8-inch shells, either from the famous gun or fired at later points in the war by less famous Parrott guns, have been recovered over the years in Charleston. Other Parrott shells fired into Charleston included incendiary rounds. West Point Foundry produced 500 of these in 1863, in both single and double cavity shells. A hexagonal-headed bolt in the base of the shell covered an opening into which the incendiary mixture was loaded. Besides Parrott shells, the Army used Schenkl shells in the Charleston area. Due to concerns about Parrott Projectile performance, the Navy placed large orders for Schenkl 8-inch projectiles. However, after Schenkl died in an accident, Parrott came back into favor. The Army ordered 100 8-inch James shot, although none survive today. However, a few James shells in the caliber survived the war. Except for some experimental rifles, the only the 8-inch Parrotts could fire these projectiles. During the war, the Navy also issued grapeshot to some monitors armed with 8-inch Parrotts. 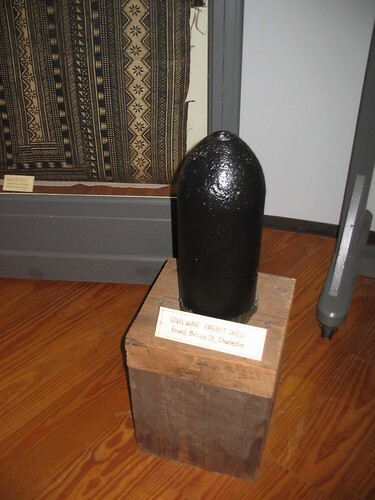 Originally intended for 8-inch shell guns, the grapeshot provided a means to repel boarders or for use in close quarters combat. Army instructions indicted the 8-inch Parrott could use the same carriage as a 10-inch Rodman gun. Arrangements were similar, although scaled up, from the 6.4-inch Parrotts for center and front pintle mountings. The Navy used the 8-inch rifles on pivot mounts or in turret mounts. On the pivot, the big rifle required a crew of 25. However, in the monitor turrets, mechanized handling gear reduced the crew to between 7 and 14. The projectiles and carriages allowed the 8-inch Parrotts to batter enemy ships and batter fortifications. In my next post in this series, I’ll look at the instances where the big rifles were used in those capacities. Bell, Jack. 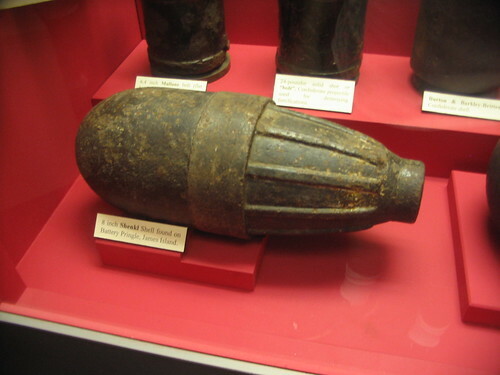 Civil War Heavy Explosive Ordnance: A Guide to Large Artillery, Projectiles, Torpedoes, and Mines. Denton, Texas: University of North Texas Press, 2003. Ripley, Warren. Artillery and Ammunition of the Civil War, 4th Edition. Charleston, S.C.: The Battery Press, 1984. 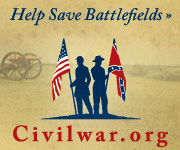 Please allow me a break from Civil War related posts to ask readers to consider a worthy cause – Valour-IT. Valour-IT is a project under Soldiers’ Angels, an non-profit organization which provides aid and comfort to military members. The goal of Valour-IT is to put information technology and other advanced technology in the hands of severely wounded service members. According to their website, the project distributed over 4100 laptops to wounded warriors (and that number, reached last year at this time, has long since been surpassed). Most of those laptops include voice-controlled software to help the user overcome disabilities. Valour-IT works with soldier care facilities and DoD case workers to maximize use of the resources. For soldiers, sailors, airmen, and marines who have suffered severe wounds, those “gadgets” are not just toys for entertainment. Rather these are critical support aids to their recovery. Computer resources in particular are almost a necessity in our society today. Putting one of these laptops, with enhanced access features, in the hands of a wounded warrior allows them to connect to their world, re-focus or re-train, and heal as a whole person. Right now, Valour-IT is running its annual fund-raising competition. Between now and Veterans Day (November 11) contributors are asked to affiliate with their “branch” – Army, Navy, Air Force, or Marines. Or if you don’t wish to further inter-service rivalries, you may donate without affiliation. Since my background is Army….. Go Team Army! Even if you cannot give at this time, I encourage you to look over the Soldiers’ Angels site. This is a class-act organization supporting those who serve our country. This week, twenty-one additions to the Civil War category in the Historical Marker Database. States represented include Alabama, Georgia, Kentucky, Missouri, New York, Tennessee, Virginia, and Wisconsin. – Three markers in Brierfield, Alabama. The Bibb Furnace produced iron for the Confederate Navy during the war. The furnace was destroyed by Gen. Wilson’s Federal raiders in March 1865. However, in an act of defiance, Mary Pratt, who operated a nearby ferry over the Cahaba River, set the boat adrift rather than allow its use by the raiders. – A new marker in Atlanta provides an overview of the battles which raged for control of the city in 1864. – A state marker provides construction details of Fort Tyler. The fort defended bridges over the Chattahoochie River, but fell to Wilson’s raiders on April 16, 1865. – Several entries from Columbus, Kentucky this week as I enter the markers at the Columbus-Belmont State Park. Confederates occupied this “Gibraltar of the West” in September 1861. Markers on site provide interpretation about the Battle of Belmont which was fought on the Missouri side opposite Columbus, the wartime river traffic on the river, and how the war transformed the town of Columbus. – A memorial in Carthage, Missouri recalls the battle fought there on July 5, 1861. – A small stone marker notes the battle of Rader’s Farm, fought May 18, 1863 in the present day city of Joplin, Missouri. – A memorial in Webb City, Missouri honoring veterans from several wars includes a list of Civil War Medal of Honor recipients from Missouri. – A memorial in Peekskill, New York honors the veterans from the town of Cortlandt who served in the war. – Entries from Humboldt and Trenton, Tennessee recall a raid by General N.B. Forrest in December 1862. Earlier in the raid, Forrest clashed with Federals in the battle of Salem Cemetery near Jackson, Tennessee. Forrest also routed an enemy force at Spring Creek. – A Tennessee Civil War Trails marker notes the last camp site used by Confederate General A.S. Johnston before the battle of Shiloh. – New interpretive kiosk on the Richmond Battlefield details Fort Gilmer. – In Page Valley, near the locality of Overall, Virginia, a new Civil War Trails marker discusses the battle of Milford, fought on September 22, 1864. – A marker in Jefferson County, Wisconsin details the number of men from the state who served in our country’s wars. According to the marker, the state sent 91,379 men to the colors during the war. 12,216 Wisconsin troops died in the war. Let’s just say Shenandoah National Park was a bit crowded this weekend. Much of our day was spent in a line of traffic slowly moving down the drive. We drove all but about 15 miles of the park’s road. Through some mix-up, our campsite was not available. So we traversed back down the valley and into Fort Valley. So we spent the night enjoying the campfire, considering the “snug” mountain outlines of Fort Valley, and listening to Passage Creek. We’ve often visited Elizabeth Furnace, but never camped out there. The camp ground offers basic services (for those who can’t get away from gadgets, there is no electricity on site). Although, not provisioned as well as a commercial campground, it is typical for National Forest Service campsites. I like that kind of experience. Real camping! You get what you packed in and that is all you get! Some have called Fort Valley a “valley within the valley” between Massanutten and Green Mountains. At the north end, where Elizabeth Furnace is located, Passage Creek cuts a path north past the mountains, with sharp inclines on each side. George Washington undoubtedly surveyed the area during his work for Lord Fairfax. According to some sources, Washington considered using the valley during the Revolution as a possible defensive position. I don’t know for sure if Washington did intend to turn Fort Valley into Virginia’s version of Valley Forge. But I do know it was a nice place to catch up on much needed rest! On our way out this morning we covered some back roads into Front Royal. Stumbled across this gate guard at the Front Royal-Warren County Airport. That is the Blue Ridge in the background to the left. The model on display is a later series production F-86H. 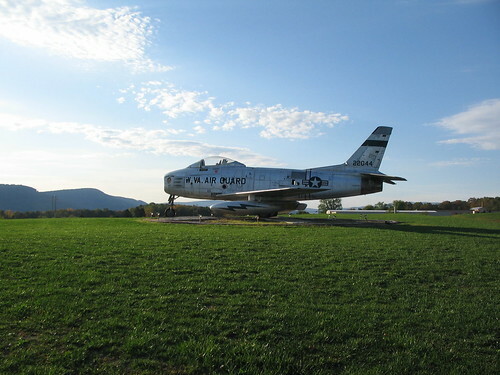 Appearing after the Korean War, the H was a fighter-bomber. I know these types saw service well into the 1960s with the Air Guard. Just rather impressive to see that aluminum glinting in the morning sun with the Blue Ridge as a backdrop. I have my marching orders then. I’m planning on a “gadget free” zone up on the ridge. Will return to blogging sometime Sunday or Monday. Short work week for the Civil War category in the Historical Marker Database. Only 25 new entries for this report, from sites in Alabama, Georgia, Kentucky, Ohio, South Carolina, Texas, Virginia, and West Virginia. – More entries from McCalla, Alabama telling more about the Tannehill Ironworks. The 8th Iowa Cavalry partially destroyed the furnace on March 31, 1865. – The railroad town of Marrow, Georgia was home to William A. Fuller, who recaptured “The General” during the great locomotive chase in 1862. – A marker outside Atlanta, Georgia details the Federal crossings of Peachtree Creek on June 19 and 20, 1864. – In LaGrange, Georgia, the Bellevue Mansion was the home of Confederate Senator Benjamin Harvey Hill. – A marker in Clinton, Kentucky discusses partisan activity in the western part of the state during the Civil War. – A plaque in Columbus, Ohio notes a speech given by Abraham Lincoln in September 1859, as he began the campaign for the presidency. – In Columbus, Texas a marker notes the location of Alleyton, which was a major depot during the Civil War. Cotton bound for Mexico and supplies heading north for the Confederate Army passed through the town. – Three markers from Fairfield, Texas this week. Captain L.D. Bradley, from the town, served with distinction during the war. A 3-inch Ordnance Rifle, one of a set used by the Val Verde Battery, was buried at the end of the war to prevent capture. Another marker notes the charity of the county, discussing the establishment of soldiers’ homes. – Father Abram Ryan, Confederate chaplain and poet, *may* have been born in Norfolk, Virginia, but most authorities say he was born in Hagerstown, Maryland. – In Portsmouth, Virginia, the Cedar Grove Cemetery includes a Confederate section and the grave of John Luke Porter, inventor of the C.S.S. Virginia. – A set of markers from Drewry’s Bluff outside Richmond, Virginia this week. A new kiosk marker orients visitors to the site. Highlights include the site of a white chapel which served the religious needs of the Confederate soldiers during the war. Another marker discusses the construction of the fortifications on the bluff. And overlooking the James River, a marker recounts the May 15, 1862 attempt by Federal ironclads to run past the fort. – Other entries from the Richmond area this week include a new kiosk marker at Beaver Dam Creek. An interpretive marker on the battlefield notes the high ground held by the Federals overlooking the creek. – A marker in Bulltown, West Virginia notes an action fought there in October 1863. – A marker near Duffy, West Virginia notes the location of Fort Pickens. The fort was first occupied by Company A, 10th West Virginia Infantry, which later served through the war in many major battles. When I was young, the family would often take a Sunday afternoon trip over to “see the river.” There was little need to specify which river, as everyone assumed you meant the Mississippi River. 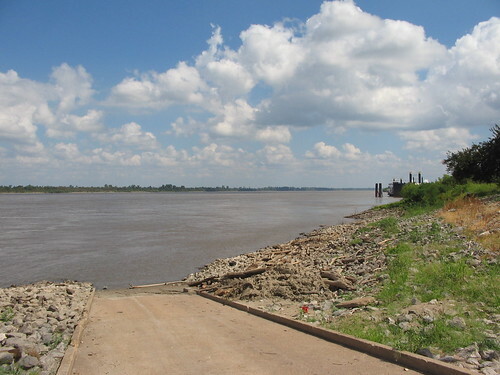 Our usual stop was along the river levee at Caruthersville, Missouri. I can’t say this rather average section of North America’s largest river saw any momentous events. As a young boy who’d read about every history book in the public library, I lamented that our locality was perhaps the most boring spot in the nation. Nothing happened here. On one of our Sunday trips, maybe I was thirteen or fourteen, I realized there was history out there on this average section of the old river. Native Americans certainly passed this way, trading between those pre-Columbian cities built along the river. Hernando de Soto may have gotten this far up the river, but we just don’t know for sure. But we know Marquette and Joliet, LaSalle, and other explorers after them passed by here. Uncounted thousands (if not millions) of flatboat crews worked past this bend of the river, heading to Memphis, Natchez, and eventually New Orleans. One of those crews included a lanky young man who would later become President – Abraham Lincoln. Steam power came to the river, with flat-bottomed paddle-wheelers plying along the muddy river. A fellow named Samuel Clemens piloted through these waters. When war came, iron covered warships joined the steamboats passing downriver to attack Confederate strong holds at Fort Pillow and Memphis. But not all the river history is about explorers and boats. In January 1811, a great earthquake centered about twenty miles north of this river bend caused the Mississippi to flow backwards for a time. The shocks created Realfoot Lake on the opposite shore in Tennessee. In the last decade of the nineteenth century, men figured to “tame” the river. Toward that end the levees, massive berms, lined the river. Not content, drainage systems transformed the swampy bottom land into cotton fields. That engineering achievement, at the time the largest man-made drainage project in history, changed the flow tributaries but brought productivity to the area. The Caruthersville riverfront saw loads of timber harvested from the cleared swamps. Then Caruthersville became a cotton town. When war clouds came again in the 1940s, air craft crews flying from nearby Dyersburg Army Airfield used the bend in the river as a navigation check-point while honing their skills in preparation for missions overseas. And I could probably continue for thousands of more words relating events. In short, this “average” section of the river is not so boring as I once thought. The lesson I learned that day on the river has remained with me since. Everyplace has a history. You just have to know what you are looking at.